You searched for: Category Politics and government Remove constraint Category: Politics and government Category Urban issues Remove constraint Category: Urban issues Subject Indigenous peoples--Legal status, laws, etc. Remove constraint Subject: Indigenous peoples--Legal status, laws, etc. 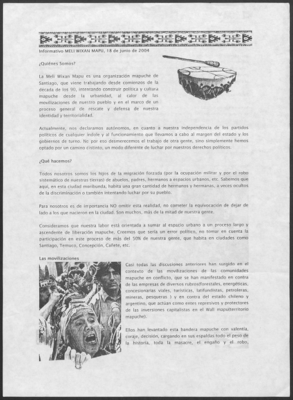 Informativo Meli Wixan Mapu, 18 de junio de 2004.